Smart home solutions are something that are here to make your life much easier. Smart homes aren’t any costly ways out there. Now a days there are many companies that have been offering the users with some affordable and reliable smart home solutions. Cyfrodom offers you the best smart home solutions among all its competitors in the mark these days. Turning smart doesn’t actually mean spending lost of money from your pocket but it has become quiet an affordable and budget friendly affair with the companies like Cyfrodom offering us the smart home solutions that fit our budget. 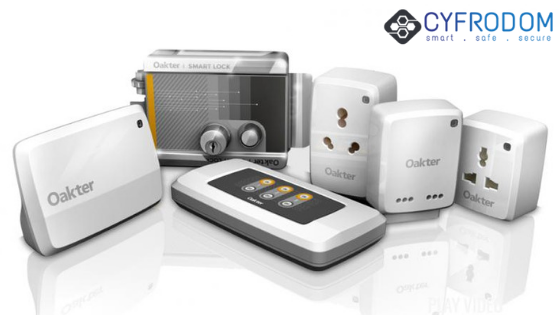 Cyfrodom offers you to home automation solutions powered by Oakter that will make your smart home experience and better and a more customized one. Automating all these above-mentioned things like lights, fans, and various other electronic devices in your home to make your tasks of switching on and off very easy even when you are away from your home. These automated solutions actually help you in saving power as you have the power to switch on and off your lights right at your fingertips. Brand Oakter is an offshoot of Mechartes Researchers Pvt Ltd, one of the world’s leading companies in engineering design and simulations. Mechartes was started in 2005, under the tech incubation program of IIT Delhi. Oakter was launched in 2015 after two years of research and development. The versatile Oakter app lets you schedule and time your appliances, configure voice control with voice assistants, turn your devices ON/OFF from anywhere, play your favourite channel on your Set Top Box, change your AC’s temperature and more.